When black holes meet: ‘When two galaxies collide, massive black holes in their respective centers fuse in a dramatic flourish that creates a telltale “X” mark, according to astronomers. Jets from the core of radio galaxy NGC326 …seem to have abruptly switched direction, a possible sign of a black hole merger. 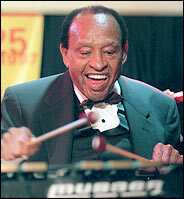 Lionel Hampton, whose flamboyant mastery of the vibraphone made him one of the leading figures of the swing era, died yesterday morning at Mount Sinai Medical Center in Manhattan. He was 94. Despite his youthful appearance and impressive stamina, Haden has had a rough time lately, and the facial expressions might reflect or relieve his pain. A few years ago, he had back surgery, necessitated by decades of bending over his bass, at an almost perfectly perpendicular angle, to hear the notes more clearly. While in the hospital, he nearly died of pneumonia. Shortly after, he and his wife, the singer Ruth Cameron, were attacked by a Rottweiler outside their home in Malibu. The dog bit Haden on his left hand, between the thumb and forefinger. He underwent extensive physical therapy and couldn’t play for three months. ”It still hurts,” Haden says, especially when he moves his hand up and down the neck of the bass, which he does most of the time. Then there’s his longtime bout with tinnitus, which causes ringing in his ears, and hyperacusis, which heightens the perceived volume of sounds. He’s learned to ignore the ringing, and surrounds himself with plexiglass when he plays with horns or drums. Jewish groups have expressed outrage that a British company is selling sport shoes with the same name as the Nazi nerve gas used to kill millions of Jews in the Holocaust. Umbro, the firm that outfits the English national soccer side, said it was an “unfortunate coincidence” that its Zyklon shoe, on sale since 1999, bore the name of the poison gas Zyklon B. The company says the shoes will be renamed or withdrawn. The name appears on the box but not the shoe itself, so it looks likely they will allow already-shipped stocks to remain in stores without modification.